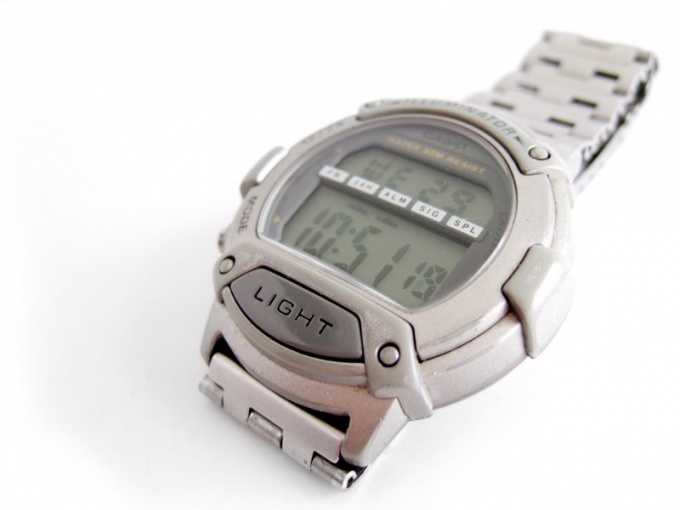 Casio watches are electronic and electro-mechanical. They are much less sensitive to dust than mechanical watches with the spring drive. So you can open them at home and to change the battery. Despite the slight sensitivity of Casio watches to the ingress of fine dust, set up your work space so that large dust, visible to the naked eye, it was not. Provide good lighting. Note that after a battery replacement, the watch will lose water resistance. If it's length you need, use the services of the workshop. Do the same in that case, if the watch is under warranty. The bottom cover are attached to the clock in different ways. If she just tightly inserted into the casing, pry her thin slotted screwdriver and gently pull out. Screwed down the lid remove. If it rests on four screws, gently turn them miniature Phillips screwdriver. Separating the cover, do not lose the sealing rubber gasket and not tear it. In any case, do not clamp the watch in a vise as during disassembly and Assembly. Pay attention to how a battery. She usually turned up positive conclusion. The latter is connected with the housing element. Carefully pry its dielectric object and pull it out. If necessary, move the front of this upper flat spring. Open hours put into a clean sealed box. For a new item go to the subway - often sell them there. Do not try to buy the battery in the workshop - it will take together with the price of batteries and the cost of its replacement, although the latter was not made. Show the item to the seller and buy the same. Do not short circuit it. Install the battery in the watch, observing polarity, and, if necessary, push top of flat spring. Make sure that the device has earned. Install the cover in reverse order, not forgetting the rubber sealing gasket. If the cover is pressed into the housing, be careful not to crush the opposite side of the watch glass. Check the operation of all controls, and set the current time. Avoid exposure to watch for static electricity. The air in the place where the repair hours should be not too dry, not to accumulate electrostatic charges, but not too wet, otherwise the part can corrode.